Have a lot of green tomatoes? 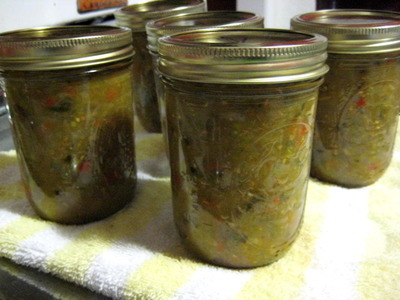 Here’s the link to Farmgirl Susan’s Green Tomato Relish. 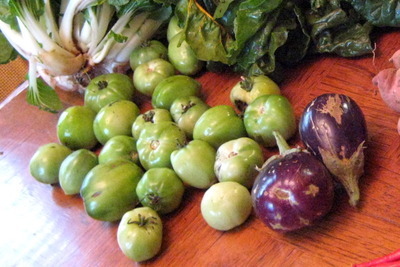 It’s very good, easy to make, uses up a lot of green tomatoes (2 pounds per batch), and is fun to have for the winter. Nik and I made it yesterday. We made a double batch and got 6 pints along with a little for eating yesterday. It’s quite vinegar-y and I think I must admit that it reminds me a smidge of Mom’s pickles that she made from sliced cucumbers zucchini when we were young. I remember despising those with a passion, really despising them. So I think either I have a bad memory and this doesn’t taste like those did – or my tastes have matured! Anyway, it takes a bit of time to chop all the stuff but then you just let it cook for an hour, put it into jars and process it for 15 minutes in a boiling water bath. Very easy and very good! My only comment on the recipe is that she says not to use supermarket apple cider vinegar. I didn’t have anything else and didn’t have time to search out what she recommended. So I just used my Heinz apple cider vinegar that I had already. I’m assuming that it will be fine, if not as ideal. I also used Winesap apples. And she says that the cumin is optional but we definitely used it and it tastes great. P.S. The more things I have in the freezer/canned, the more I feel the desire to can and freeze. I think I understand the squirrel’s drive to bury every last acorn he can find before winter comes. This entry was posted in canning. Bookmark the permalink. 6 Responses to Have a lot of green tomatoes? Those were zucchini pickles – trying to use up the baseball bat size zucs we had that year. I frankly don’t have good memories of them either! @nanacilla – Got it! As I was typing “cucumbers” – I was wondering where you got them since they don’t really grow easily in AK! I’m glad you didn’t like them either! I totally agree with that love of preserving food. How are plans progressing for the side yard? That made me laugh! I shall call him Broccoli Strawberries! mmm, that looks tasty. You’ll have a TON for winter!